E Pluribus Unum – Out of many, one. Nestled on a gold scroll, which is being held in place by an outstretched bald eagle. In front of the bald eagle a shield (an Escutcheon), and above the eagle a Constellation (a “glory”) with 13 stars. In the eagle’s right talon (known as the dexter talon) an olive branch, and in the left talon (known as the sinister talon) 13 arrows. The prominent colors of red, white and blue are richly featured throughout. All of this makes up the front side of the Great Seal of the United States. Our national coat of arms. More than just a decorative symbol, the Great Seal represents the living embodiment of who were are, or should be, as a nation. One force, a unique people, a single entity united in strength. To ignore this legacy is to doom us to division, a scattered collection of self-serving beings; in view of each other, but adrift. We have inherited so much from our Founding Fathers and Mothers. The Declaration of Independence, the Articles of Confederation and the U.S. Constitution. Pen to paper; words that led to deeds, freed a people and started the evolution of enlightened liberty. Our ancestors set the bar high, knowing that standing on their shoulders, we would strive for a more “perfect union.” More than just “old, white men,” they were visionaries, enlightened souls who were fearlessly committed to the notion that each person was “endowed by their creator” with the rights of self-government. The Great Seal is a call from our past, a reminder of the good qualities of our union. In times of crisis and confusion, the Great Seal is our “aide-mémoire,” our national conscience. At times flawed, but when our backs are against the wall, stronger together. How sad would it be if this call fell on deaf ears, to a generation divided? Each part of the Great Seal retells the qualities that define our country. Blue represents justice, vigilance and perseverance. White indicates innocence and purity. Bold red reminds of our valor and resoluteness. The “glory” is a proclamation that as a new nation, “We the People” have ascended as a sovereign, free nation; equal among all established nations, yet unique in its commitment to liberty The olive branch symbolizes our desire for peace, the 13 arrows our commitment to the defense of liberty. The shield a declaration to all of our national virtue of self-reliance. These are the intrinsic values of a great nation; these are our virtues to claim and promote. Lexington and Concord, Yorktown, Gettysburg, Normandy, and so many other named and unknown parcels of lands. This is holy soil, a reminder of this country’s commitment to liberty, ordained by our most precious treasure, our sons and daughters. Those who answered the call to action against oppression, who fought the eternal battle of good versus tyranny. Those who fought for a cause greater than themselves, each representing the Great Seal of the United States. Our country has been tested, and at times we have failed. Our country has drifted, and at times tried to tear itself a part. I refuse to believe that I am naïve, nor am I blind to the landscape of a reality viewed from many different vantage points. In those times as a nation that require a commitment to clarity, to make sense of something that seems beyond our understanding, the Great Seal calls to us and brings tranquility to our nation. Knowing who we are will eventually lead us to the right course of action. 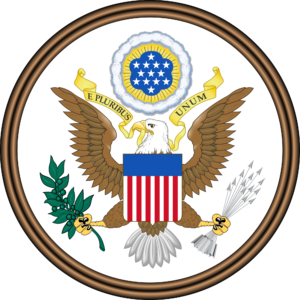 This entry was posted in History and tagged E Pluribus Unum, Great Seal by jeffchidester. Bookmark the permalink.